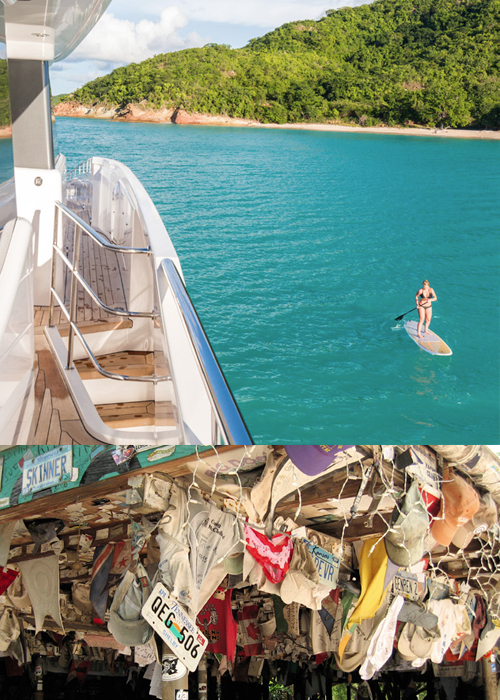 The BVIs are the ideal destination for first time charterers and seasoned sailors alike. The numerous cays and anchorages are protected from Atlantic swells and treated to light tradewinds. You might know them only as Tortola, Virgin Gorda or Jost Van Dyke, but there are over 60 islands and cays that comprise the British Virgin Islands (BVIs). This cluster of mostly volcanic islands stretches for 35 miles along the Sir Francis Drake Channel and provides some of the most sought-after cruising grounds in the world. 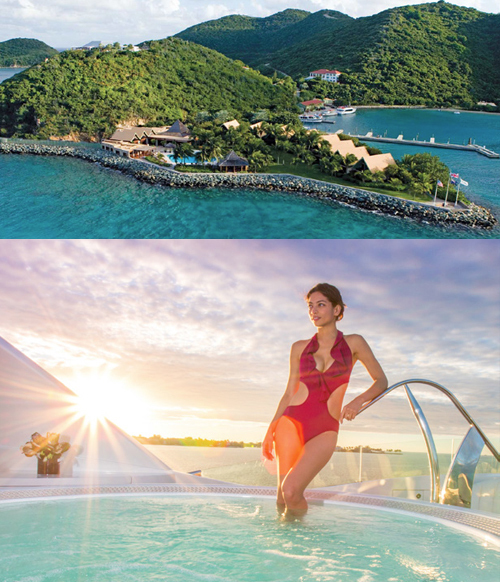 The BVIs are the ideal destination for first time charterers and seasoned sailors alike. The numerous cays and anchorages are protected from Atlantic swells and treated to light tradewinds; the cruising conditions are comfortable and the climate is perfect year round. Many of the islands in the BVI are uninhabited and have been designated as national parks. Each island has its own distinct flair, but all with an endless supply of snorkeling and diving sites, white sand beaches, beautiful bays and stunning scenery. 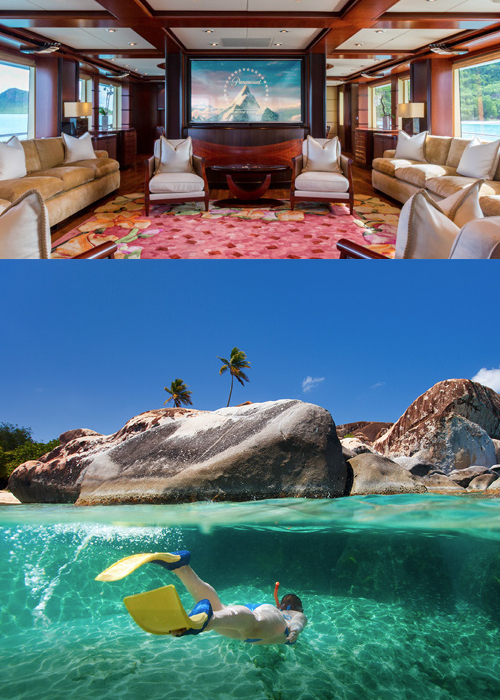 Because of the short distances between islands, you can customize a charter in the BVIs to suit your fancy each year. From snorkeling and diving escapades, to lazy beach bar hopping, to recreating a swashbuckling pirate experience, the BVIs provide it all and then some. Upon your arrival to Tortola, the crew of Usher will be standing by to welcome you aboard. Beef Island, a small island linked to Tortola by bridge, accommodates both private jets and commercial flights direct from San Juan, Puerto Rico. From here, it is simple to step off the airplane and onto your yacht. As you settle in, enjoy a glass of champagne or one of our specialty tropical cocktails along with some hors d'oeuvres prepared by our world-class chef. Take in the beauty of the stunning coastline and bask in the warm Caribbean sun as you explore each of Usher's three decks. This afternoon, don your sunscreen, floppy hat and beach gear for a bit of swimming and the first of many beach excursions. Sink your toes in the white, sugary sand and relax with a view of the picturesque islands of Great Camanoe, a private residential island, and the uninhabited Little Camanoe. Return to Usher to freshen up and join your guests on the cool aft deck for an incredible meal created by your dedicated chef. As the sun sets, breathe in the tropical air and brilliantly colored sky. Now, you're on island time. 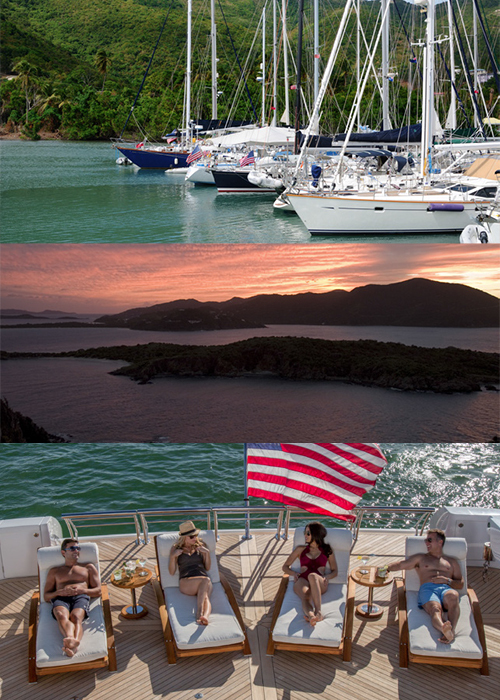 After an early morning coffee as the sun rises or a leisurely brunch on the aft deck, tender ashore to Peter Island. Much of the charm of this little piece of paradise lies in its exquisite natural landscape. Enjoy a morning hike along five miles of meandering walking trails that provide water stations and majestic views of surrounding islands. After an invigorating walk, head to the renowned Peter Island Resort for a Frangipani and coconut body wrap or the treatment of your choice at its five-star, full-service spa. Afterwards, check out one or more of Peter Island's five pristine white sand beaches, each unique and easily accessible by tender. Enjoy cocktails at Deadman's Beach Bar and Grill followed by "a delicious slice of heaven" with dinner at the resort's signature beachfront Tradewinds Restaurant. Norman Island is a small, uninhabited island located at the southern tip of the British Virgin Islands archipelago. As one of a number of islands reputed to be the inspiration for Robert Louis Stevenson's pirate novel Treasure Island, it is truly a buccaneer's paradise. Norman Island is a popular destination for treasure hunters and snorkelers alike, with three water-level caves at the base of the cliffs near The Bight being ideal for adventurous exploration. The island was also the sight of the discovery of treasure looted from the Spanish galleon Nuestra SeÃ±ora de Guadalupe upon its sinking in 1750. Some lucky explorers have reportedly found gold dubloons in the depths of the caves and surrounding waters. This evening, take a tender ride to the world-famous "Willie T," a floating bar named the William Thornton that is still full of pirates. Make new friends and trade stories of adventure at the bar before you take your private tender back to the tranquility of Usher. Enjoy a peaceful morning aboard Usher before tendering ashore to explore all that Virgin Gorda has to offer. 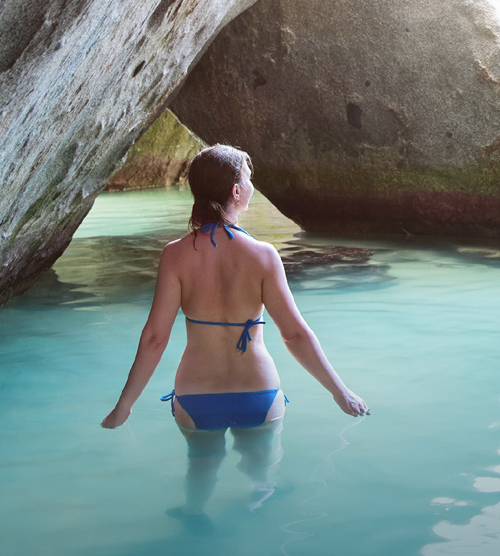 The third largest of the British Virgin Islands, Virgin Gorda is home to the famous Baths, an unusual geological formation that is lasting evidence of the island's volcanic origins. Huge granite boulders lay in piles along the beach and form scenic grottos that open to the sea. After exploring the Baths, relax and indulge at the timeless and elegant Rosewood Little Dix Bay with a Neem leaf facial, a game of tennis or pool time overlooking the sea. Upon your return to the boat, Usher's chef will treat you to an unforgettable dinner that celebrates the local flavors of the islands. After a refreshing tropical-inspired breakfast, take a morning dip in the crystalline waters before Usher picks up anchor to cruise the stunning North Sound. The North Sound offers the best area for testing out each of Usher's many water toys while the Bitter End Yacht Club rents Laser dinghies for a day sail. After a full day of exploration above, in or under the water, cap the day off with a sunset kayak to the storied Bitter End Yacht Club to mingle with other yachtsmen sailing the Caribbean. Nearby Saba Rock is also a breathtaking spot to watch the sun go down, and its tropical cocktails and calypso tunes are just a short tender ride away. After sunset, let Usher's crew treat you to a theme night, a fun-filled event certain to delight with fantastic food, beautiful decorations, and spirited service. Today we'll make our way to Sandy Cay, a breathtaking, uninhabited stretch just off of Jost Van Dyke. Only reachable by boat, Sandy Cay's pristine, white sand is perfect for beach-goers, and it also boasts world-class snorkeling. Nearby Jost Van Dyke is known by travelers around the world for its casual lifestyle, waterfront restaurants and bars, protected anchorages and fine beaches. This is truly the "barefoot island." If you time your charter to be there during a regatta or a race, you'll get to see what makes this island something special. Jost Van Dyke is home to the famous Soggy Dollar Bar, purportedly named after a thirsty patron who once swam ashore there. It is the birthplace of the Painkiller, a delicious rum-based cocktail finished with fresh nutmeg. Compare Painkillers at Soggy Dollar with another iconic bar on the island: Foxy's. Many people don't know who proprietor Foxy Callwood is, but he's an amazing person who has traveled the world over. He's also a talented musician and may even make up a song about you and your boat. Ask about the bubbly pool, where the swell cascades through a series of rocky ledges. After the sun sets, return to Usher feeling no pain, and enjoy the lively yachting scene around Jost van Dyke from the luxurious comfort of your own yacht. 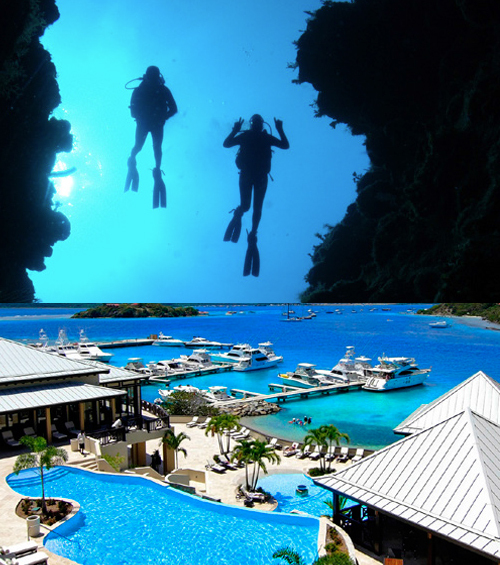 Today you'll revel in the comfort and luxury of the Scrub Island Resort and Marina. Built in 2010, the resort boasts three private beaches, world-class restaurants and an impressive marina. After a delicious, made-to-order breakfast aboard Usher, set out by tender to explore the famous turquoise bays surrounding Scrub Island. Usher's dedicated crew will happily lend their diving expertise to help you to discover hidden treasures below the crystal clear water, and you are encouraged to make good use of the snorkels and scuba gear onboard. Enjoy the day soaking up the island's natural beauty and fascinating marine life, then return to Usher as the sun dips low in the sky. A multicourse dinner under the stars awaits to mark your final evening aboard.